I am a writer, spiritual entrepreneur and armchair activist who happily resides in the Santa Cruz Mountains of California with my family and a menagerie of pets. My articles have been published locally, internationally and online. I am a winner of the Women’s Memoirs contest for a vignette from my memoir in the eBook Tales of Our Lives. A member of the National Association of Memoir Writers, I love travel, the outdoors, Jazzercise and music. 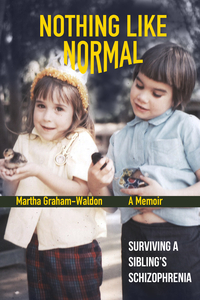 My debut book, the memoir Nothing Like Normal—Surviving a Sibling’s Schizophrenia was published by Black Opal Books on November 14, 2015. This blog features updates on my writing projects and it will serve as a voice for myself and others who have faced mental health issues in their families or in their own lives. It will also feature my writing on a wide range of topics with original photos and posts. This is a new adventure for me so who knows what will appear! Join me on this journey and feel free to chime in. Martha, thank you for “liking” my post today. I dropped in here to see what’s going on, and I find another armchair activist and memoirist. Love it when that happens. Congratulations on launching your memoir soon. We are a mental health/illness family with members attempting to cope with bipolarism, Asperger’s, and ADHD. Never a moment in the day I’m not praying that something will eventually change. Look forward to getting to know you as a fellow writer and armchair activist! Thanks, Sherrey! I’m glad to meet you as well! I have been enjoying your newsletter and posts. Glad to connect with a like-minded writer. Blessings to you and yours! Received a notice today that you have begun following my blog and I’m happy to have you among my community of followers. Beginning to work on my review schedule for 2016 and hope to have news for you soon about a review date. I wonder if in the future you might be willing to appear as a guest on my blog. Something to ponder. A colleague of yours suggested that I add your book to my new Monterey Bay Author’s blog. With your permission, I’ll post a blog about your book along with your website link. I just read the December issue of Central Coast Writers “Scribbes” (I love that name) and saw that you’re speaking on Jan. 12th – good luck! p.s. thanks for actively following my blog – I really appreciate it! Hi Dyane! Thank you so much for the referral to Monterey Authors. I didn’t know who had done it, now the mystery is solved! I am appearing in Monterey on the 12th (gosh, I need to work on that speech!) I also wanted to thank you for your comment on the Women’s Memoirs site. It was one of the first and that opened up a whole new influx of comments. You are very supportive and the least I can do is follow you in return! I will even try re-tweeting when I am feeling brave! Best wishes to you and your family in the New Year! No pressure to retweet – this gracious “thank you” comment you left made my day! Take care & I know you’ll do a fabulous job on your speech. Also, I promise to write a review for your book on Amazon; I’ve been slammed with a lingering cold/cough that flipped all my plans upside down, but it *will* happen. Be well & enjoy this rain! You are the best! Happy 2016! Hi Martha, thanks for “liking” my post on March Madness. I’m enjoying being back on WordPress where things are familiar. Hope you’ll choose to follow my blog as I’ll be stopping my newsletter in a few weeks.